The NHL All Star fantasy player draft was every bit as engaging, entertaining as I hoped it would be. From the cheesy pinstripe suits to the awkward, honest player interviews, the entire affair was a landmark piece of programming for the NHL and hockey players worldwide. If the league is hoping for a new television contract, this is the type of exposure they should continue to produce. All credit must go to the players themselves. The NHL’s best carried themselves with a rarefied aura of humility, uncommon for most professional athletes today. It’s the same reason why HBO’s “24:7 Road to the Winter Classic” was such a huge success. In general, professional hockey players are a goofy, good-natured group of guys who have avoided so much of the pampering that corrupts many of our best and brightest young athletes. There would be too many bruised egos and damaged reputations to pull off this type of fantasy player draft in other professional sports leagues. I find it hard to believe that NBA/MLB/NFL players would handle themselves with the same generosity of spirit as their counterparts from the NHL. Take for example Phil Kessel, the Toronto Maple Leafs forward who was the last player selected in the All Star player draft. He was able to laugh the entire experience off and carried himself with a sense of “oh well, if it had to be somebody it might has well have been me”. After the draft was over, it looked like the entire stage of players were ready to take Kessel out for a drink or two. Thanks to the NHL for trying something different and for giving us fans a chance to get to know the players. The All Star draft was a great way to market the league and increase its national exposure. 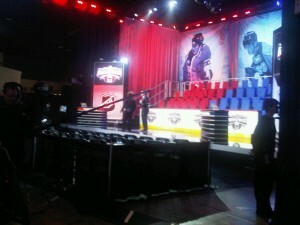 I myself will now be checking in to watch a bit of the skills competition tonight and the the All Star game tomorrow.